At the recent conference, Combating Nighthawking – reducing the threat from illicit metal detecting you were at pains to give the public the message that the main problem with metal detecting was “nighthawks”. But we know you know it isn’t since you are aware that the historical knowledge lost due to non-reporting by a few hundred criminal nighthawks is tiny compared with the vast amount that is lost due to non-reporting by 60% of “ordinary” “legal” detectorists. We also know there is consequently a strong body of opinion in English Heritage in favour of some sort of legislative control in order to tackle this “legal” loss and that the words of your Dr Peter Wilson, “English Heritage has no plans for wanting metal detecting banned” is not the whole story, although several obvious political and strategic considerations prevent you from saying so. We should like to suggest, however, that there comes a point at which coyness is misplaced and actually damaging. Your recently commissioned study of Nighthawking illustrates this well. It opines that “Restrictions on hobby detecting can be counterproductive” yet makes no reference to the fact it can also be highly successful – for instance, in the Republic of Ireland where hobby detecting is banned or in Northern Ireland where it is licensed (and where the report admits nighthawking is almost unknown). Not pointing out the fact that proper laws, properly applied, CAN greatly reduce damage is facilitating damage, surely? We should like to put something else to you. 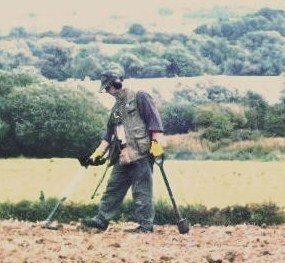 Although many metal detectorists claim long, loud and en masse that “restrictions” will “drive the hobby underground” and “massively increase nighthawking” there is no certainty that this would happen to a significant degree in the end. These are threats, not certainties, and as such are not something upon which public policy ought to be based. Indeed, they are akin to blackmail and should not be allowed to succeed. Further, it is worth recognising that not all detectorists think licensing is a bad idea. Many, (the more thoughtful and respectable, as can be easily seen) support it and have said so. It must therefore be asked whether it is fair that moderate sensible voices within the hobby should be ignored merely because there are other, bellicose ones threatening lawbreaking? It seems to us that no-one in the hobby that reports their finds in accordance with the Code of Practice would have either a wish or a reason to be opposed to measures to ensure all others acted in the same fashion. Perhaps they should be asked? Might it not be reasonable that the co-operative (and “responsible”) detectorists who already report their finds are the ones whose views are heeded rather than the others? In logic, one might just as well seek and act upon the views of nighthawks as those of non-reporting detectorists do you not think? In essence then, our plea is for policy to be based upon a single sentence expressed at your conference by Dr Andrew Rogerson of Norfolk County Council. He said: “There is a common heritage, but that must include all detected, recordable material.” On that basis (and who can deny it’s validity) the problem is NOT primarily nighthawks, nor is the voluntary system a fantastic success. On the contrary, most detected, recordable material is NOT being recorded and the bulk of the damage is being caused by ordinary, non-nighthawking, non-lawbreaking non-reporting metal detectorists. Surely that little-spoken-of but inescapable reality should govern all that is said and done by English Heritage? "Hobby metal detecting - not nighthawking, perfectly legal, but with a 60% probability that nothing found will be reported and a cumulatative effect far more damaging than nighthawking."